The other day, I pulled out a fortune that had been in my wallet for a while (the little paper ones you get in fortune cookies, not a wad of money), and it got me thinking about this post right away. Those who know me already know that I’m no stranger to taking chances, but it’s great to have additional reminders from time to time. It’s not always easy living out on the edge, but I can tell you from experience that it’s where all the fun is. My response was that it’s often the little chances that are the most important to take. Few people make giant leaps or take the kind of life-altering chances like moving to a new continent without building up to them through a series of smaller actions. I believe that change begets change, and that we have to step outside our comfort zones and up to the edge from time to time in order to keep ourselves moving forward. That is, if this is the path we choose to lead. 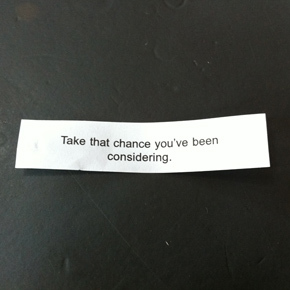 Speaking from my own personal experience, taking chances has been a way of life for me for as long as I can remember. That doesn’t mean it’s easy – it just means that I’m used to it. One big chance I’m in the process of taking is moving out of Atlanta, which is where I’ve spent the majority of my life and where I have a huge network of friends, family, business contacts, etc. Portland has been on my radar for almost 2 years now and it feels like the time is right to take the chance that has been pulling at me all this time. And last year, I took some smaller chances traveling through New Mexico and camping in the Pecos Wilderness on a cross country road trip, which ended up being one of the best experiences of my entire life. There were several moments on that trip that I had the opportunity to take chances, and I embraced them at every turn. I’m often curious how other people handle this topic, and I try to learn as much as possible from their feedback. Well said, Lisa. I couldn’t have said it better myself. So, here’s the question – what chances are you taking in your life? Big or small – I want to hear about them in the comments below. Special thanks to everyone who shared for this post. You are all awesome!